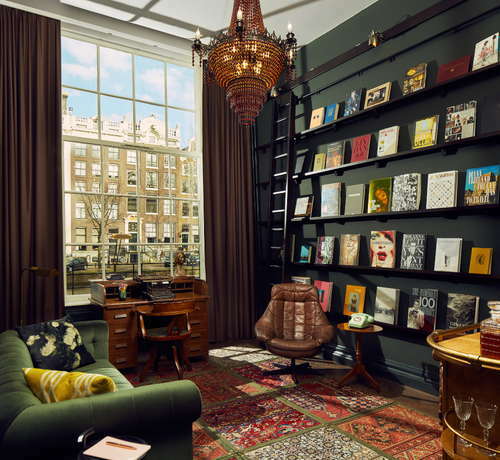 One of the Amsterdam’s largest historic monuments, the hotel was named for its original owner (yes, he is related to the Pulitzer Prize founder) and today it’s (almost) everything a luxury hotel in Amsterdam ought to be. 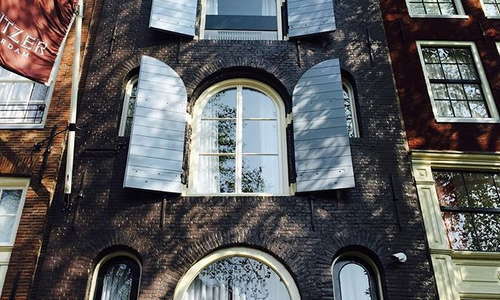 Overlooking the picturesque Prinsengracht and Keizersgracht canals are 25 interconnected canal houses recently restored to create a stunning whole that is sophisticated yet contemporary with distinctly Dutch quirks. YOU SHOULD KNOW Yes, we said “almost,” because while damn near perfect, there’s no spa or pool here, but in-room treatments can be arranged. 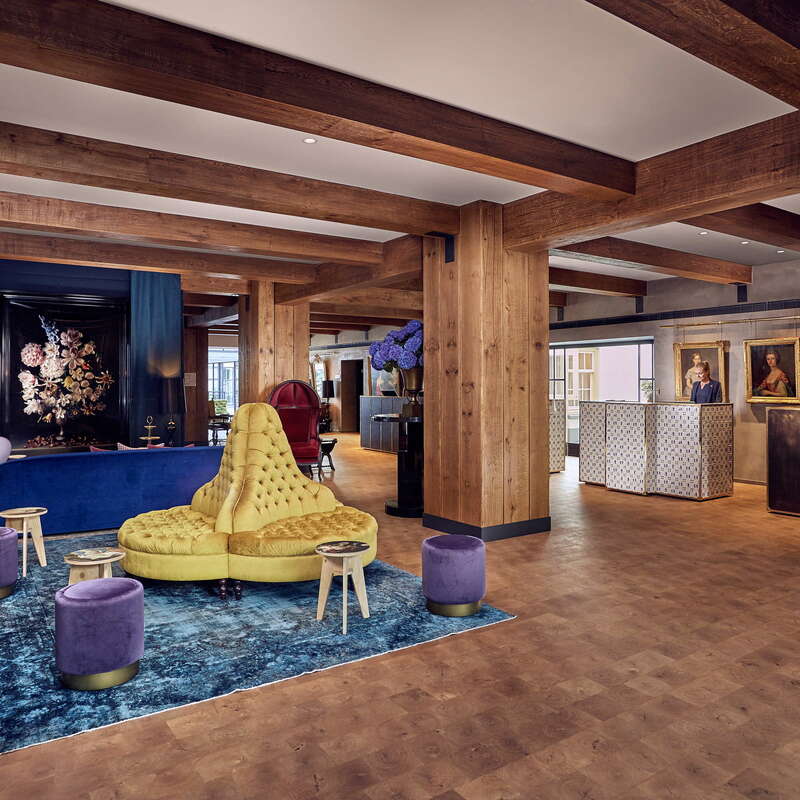 In the hotel’s 225 guest rooms and suites, architect Jacu Strauss has expertly blended the buildings’ original features and storied past with Amsterdam’s colorful present. 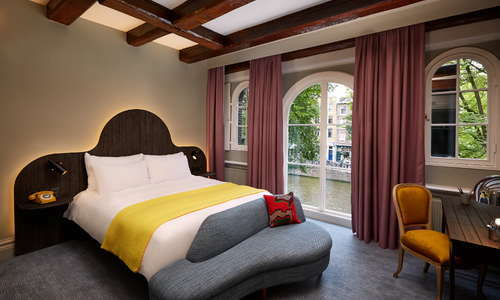 Each room is unique, yet shares a color scheme in subtle shades of yellow, purple, and blue and has views of either the canal, garden or courtyard. 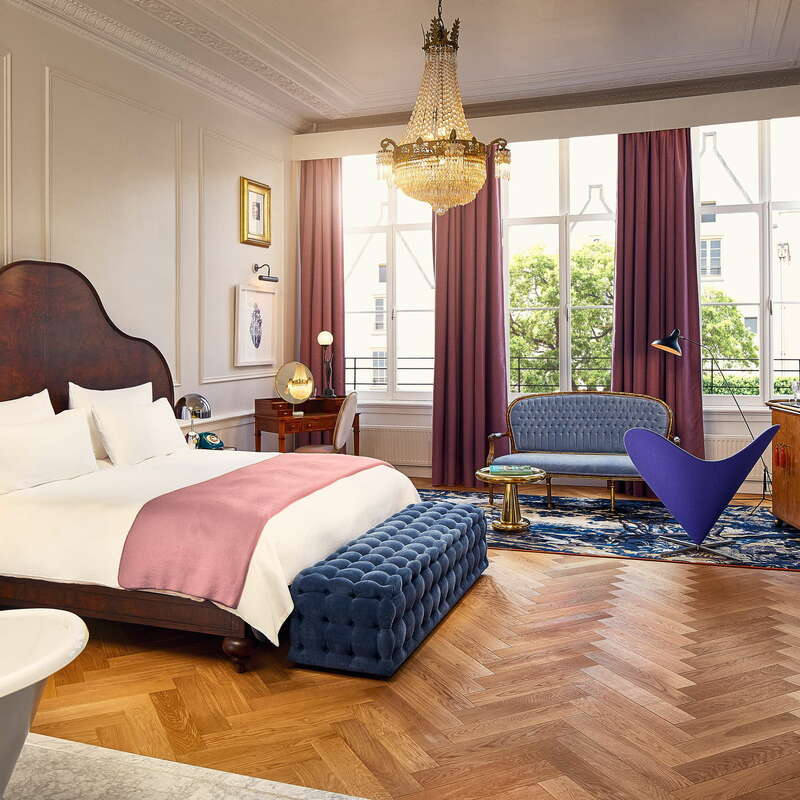 You’ll also find headboards inspired by the elegant gables of Amsterdam’s historic canal houses, and every room has a Tom Dixon desk lamp, a vintage telephone, a bicycle repair kit, and a custom-made 1930’s style drinks trolley-slash-minibar with clever cocktail mixing facilities (and recipes!). 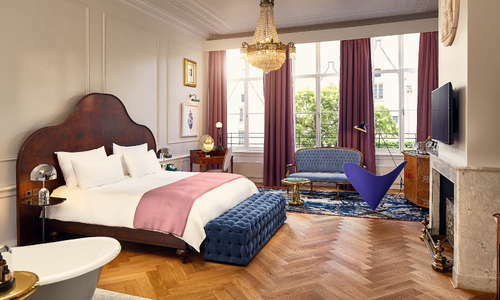 The Pulitzer’s Suite, with its ornate details, original chandeliers, king size bed and freestanding bathtub, is the ultimate romantic retreat and the Collector’s Suites, inspired by (imagined or real) past inhabitants of the canal houses (a kooky book hoarder, a flamboyant art lover, an antiques aficionado) come with private entrances, street level canal views, and awe-inspiring interiors. Travelers of all ages are welcome. There’s a family suite (2 bedrooms, 2 bathrooms, dining area and lounge), 3 family rooms (comfortably sleeps a family of four), and 8 interconnecting rooms. 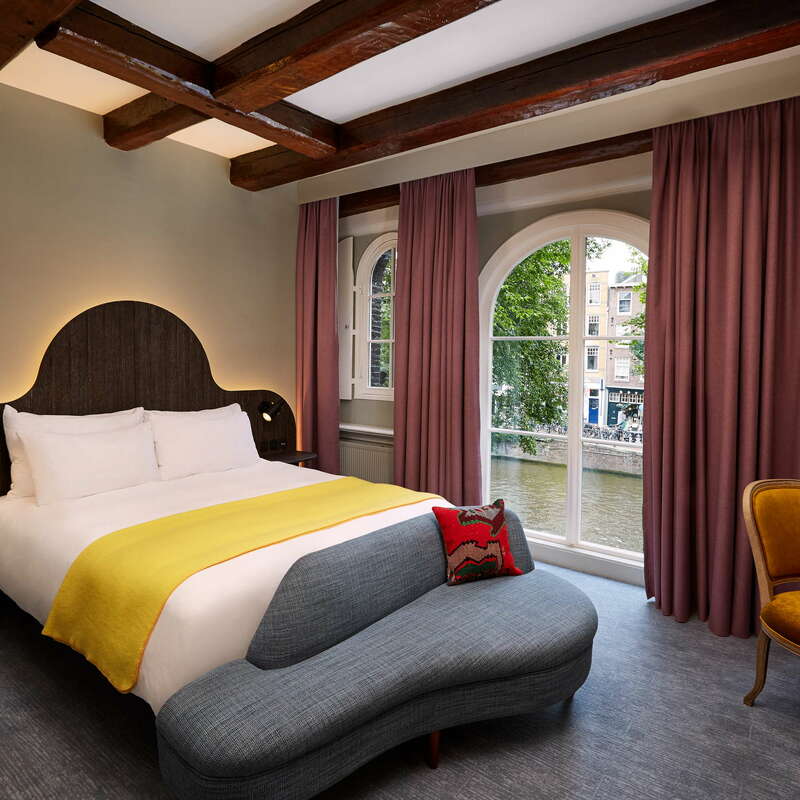 Complimentary amenities include Naif natural skincare for babies, personalized pillow cases and activity books for toddlers and Amsterdam travel diaries for older kids. 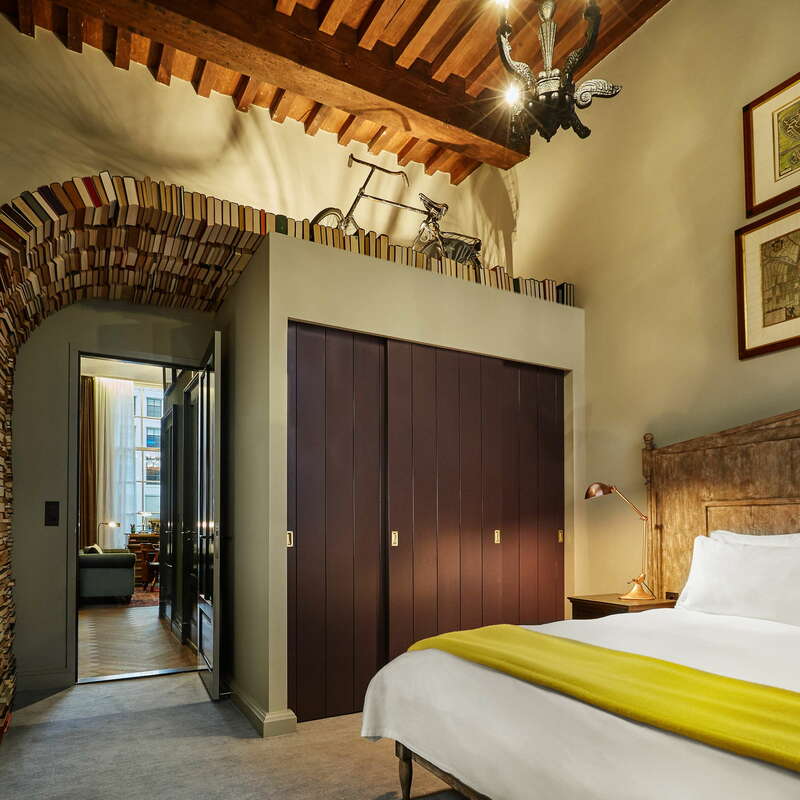 Additional amenities and nanny services are available upon request, and Jansz. restaurant offers a kids’ menu and various kids’ activities. Stylish white-on-white marble, metro tile and fluffy towels, with elegant Villeroy & Boch bathroom suites, Le Labo bathroom products, cut-glass bowls filled with all the essentials, and roomy Hans Grohe rain showers. Some larger rooms also have bathtubs. YOU SHOULD KNOW Some bathrooms feature a cheeky peek-a-boo porthole window, which may offend the shy. Greeting guests as they enter the elegantly eclectic lobby is the sweet scent of Dutch flowers from Pulitzer’s Flower Shop and suspended from the new double-height entrance building (apparently the first new construction allowed in the canal district since UNESCO status was bestowed), a black piano, which hints at the annual classical concert held on the canal here each year. 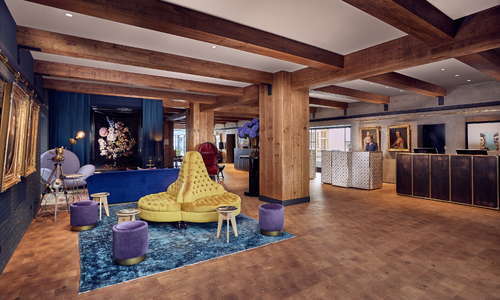 Other nods to local culture include still life side tables, end-grain wood flooring and exposed beams typical of old Dutch warehouses, and reception desks done up in 510 Delft blue tiles. Adjacent to the lobby, there’s a library with Pulitzer Prize winning books, a reference to the founder’s grandfather. 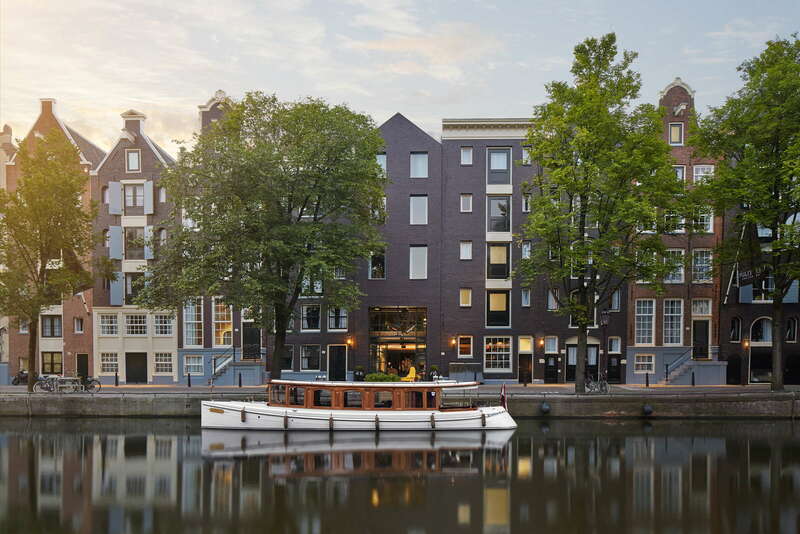 Book a 75-minute guided tour on the hotel’s classic salon boat (€38 per person) to see Amsterdam’s Unesco World Heritage Site canals in style. Situated on the ground floor, next to the lobby, is a small gym equipped with TechnoGym equipment. 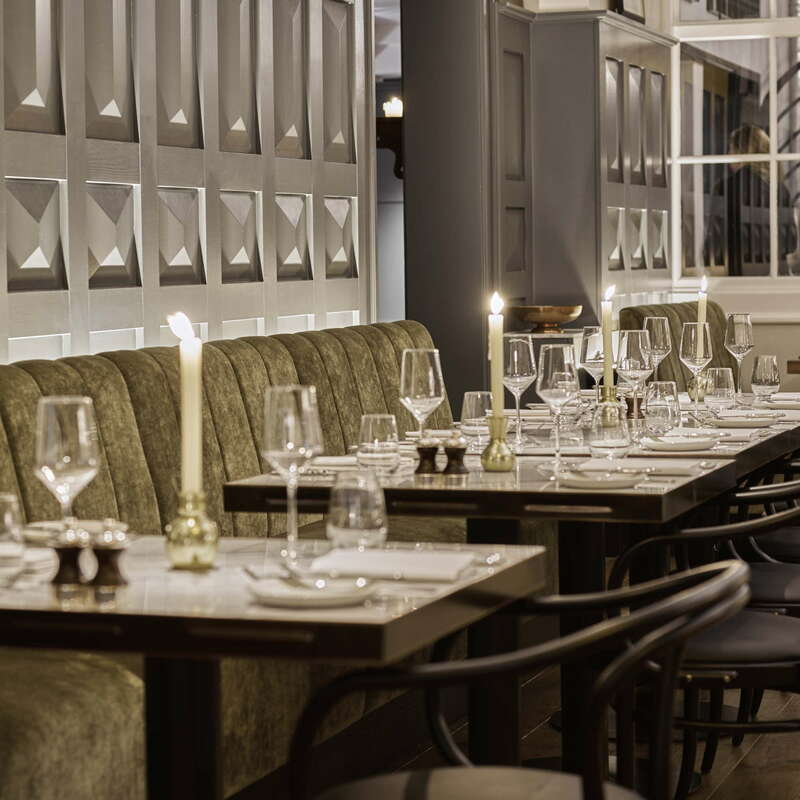 The menu at Pulitzer Amsterdam’s elegant restaurant, Jansz. 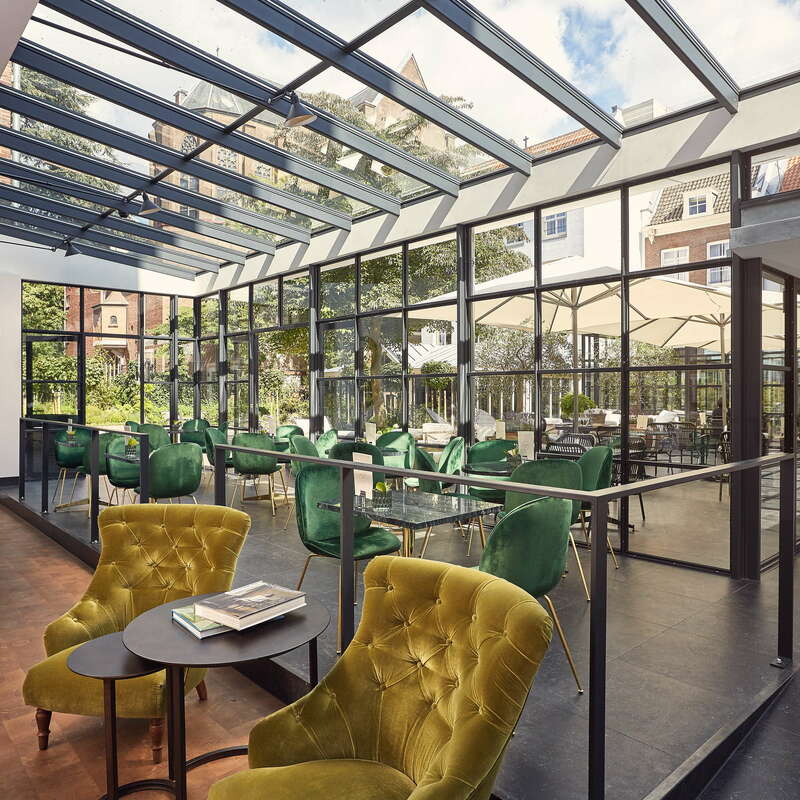 is inspired by comfort foods from around the world; expect to find dishes like Nicoise salad with seared tuna, quail eggs, anchovy-artichoke cream and olive crumbs and miso-glazed cod with Asian greens in dashi bouillon, and strawberry-basil crème brulee. A generous buffet breakfast is also served here, while the a la carte breakfast menu includes favorites such as Eggs Benedict, French toast with summer berries and banana-buttermilk pancakes. 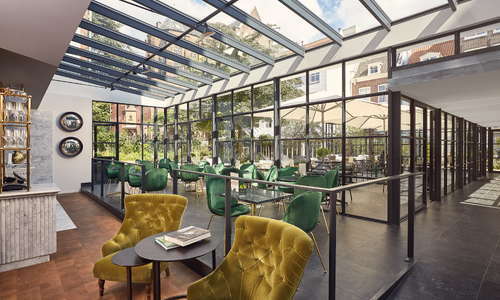 Garden café Pause at Pulitzer in the hotel’s leafy inner courtyard has four chair swings, hand-carved wooden rocking horses and comfy lounge chairs with views of Amsterdam’s famous Westerkerk church tower, as well as a menu of light bites and drinks. 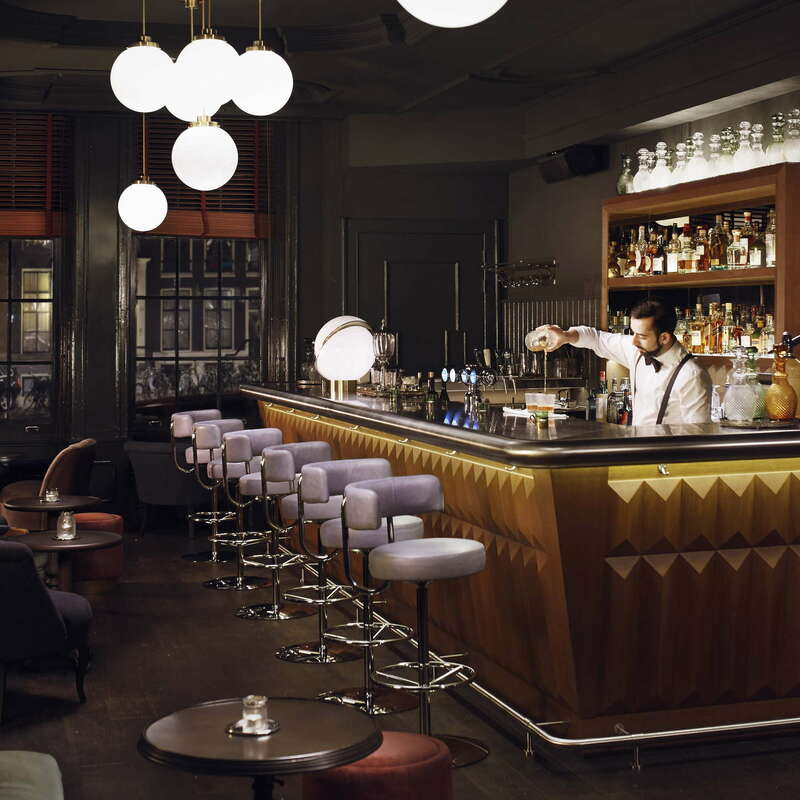 For well-crafted cocktails with canal views, intimate fireplace nooks and an Art Deco-style bar, simply stay put at Pulitzer’s Bar, one of the best in the city. 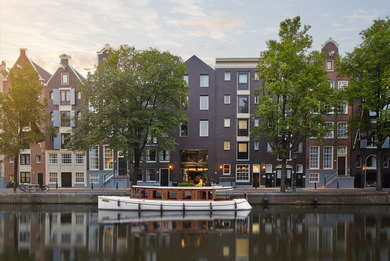 With its excellent location in the heart of the Western Canal District, you can easily walk to all the major sights. There’s also excellent access to public transport: tram lines 13, 14 and 17 (3-minute walk) will get you everywhere you need to go. 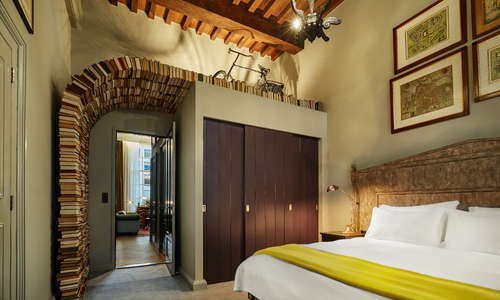 Or, rent a bicycle from the hotel (€16 per day) to explore the city like a local. In an area rich with restaurants, it’s really a matter of what you fancy. 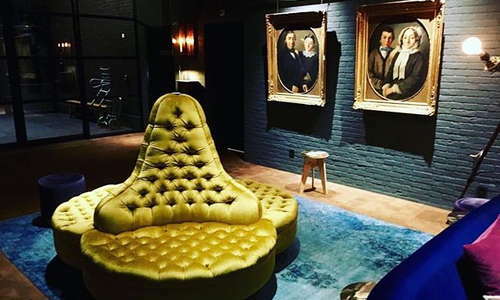 Head to zeitgeisty all-day eatery Libertine Café Café (6-minute walk) for New York-style Italian food in a moody, monochromatic setting. 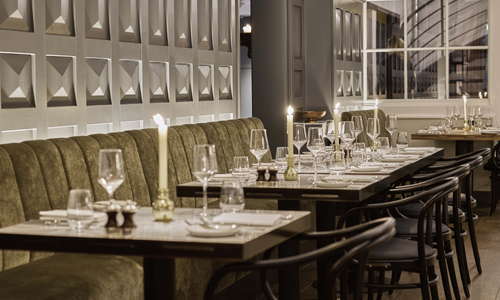 For thoughtful fine-dining in a simple neo-bistro setting, try Breda (7-minute walk), one of the city’s most respected non-Michelin star restaurants. Or, if it’s comfort food you’re after, La Perla Pizzeria (7-minute walk), is famed for its authentic wood-burning oven Pizza Margherita, and convivial vibe. Café ‘t Smalle (7-minute walk) has been around since the 18th century, when it was the Hoppe Distillery, and its canal-side terrace is one of the prettiest places to grab a casual beer. For stronger cravings, head to J.D. 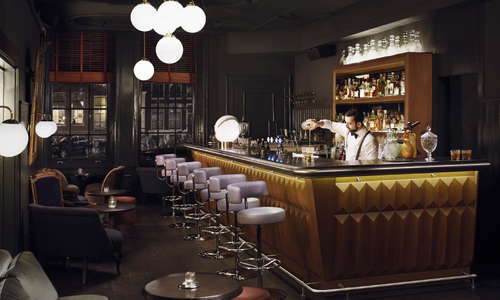 William’s Whisky Bar (9-minute walk), for an extensive range of drams, whiskey-based cocktails and pan-Asian bites. 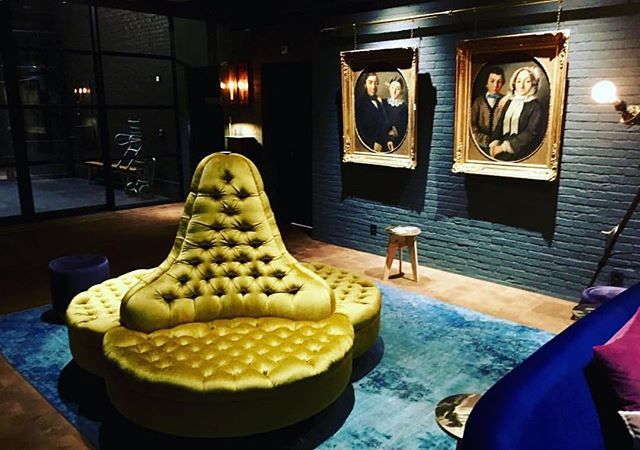 We love the modish mix of old and new in beautiful colors (think Dutch Golden Age meets Tom Dixon), the tranquil inner garden and the higgeldy-piggeldy hallways that highlight the separations between the historic buildings. 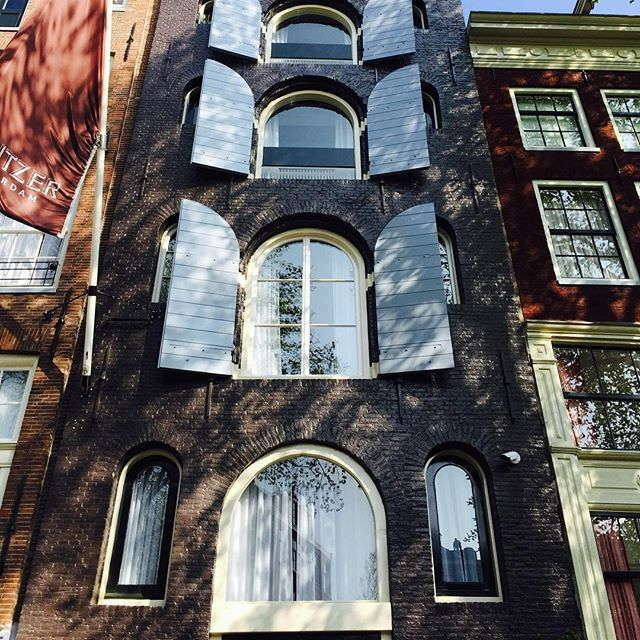 And, the location in the 9 Straatjes shopping district couldn’t be better.